The annual election of officers and directors was held last week, as was a Club Assembly featuring discussion of opportunities for committee service. Om Sukheenai will be our Club President for the 2108-2019 year. Club members fill out their ballots. Denise Bacon updated us on plans for the Auction. 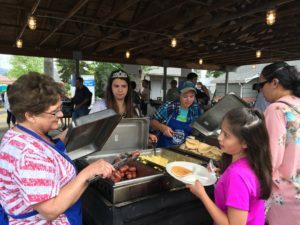 No matter what your area of interest, there are opportunities to serve in the club and have fun. A signup sheet with 11 major categories, and over 25 sub-categories, was routed around. (So if you missed the meeting, please get a sheet and sign up!) 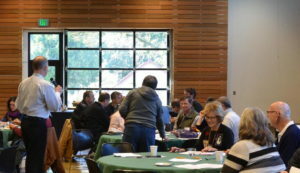 Some key committees were discussed in more detail, including the annual Auction, Membership, and Public Relations. According to Denise Bacon, chair of the Auction committee, the focus next year will be on obtaining higher-value auction items and on a wine market. 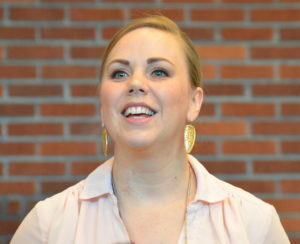 She hopes to draw more attendees from both Yamhill County and the Portland area, and to maximize the amount of revenue raised for scholarships. Lots of volunteer opportunities are available, including planning, procurement, decorating, set up and clean up, so please consider where you might be able to help. Shannon Buckmaster is the new Membership Committee Chair. When it comes to attracting new members, Shannon Buckmaster reported that recruitment and retention are both important. 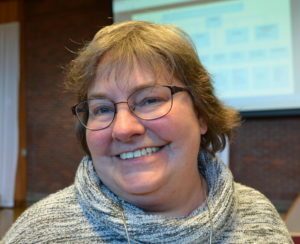 She believes the key, though, is retention She would like all new attendees to feel welcome and enjoy their experience. She is personally doing a timely follow-up call to all guests to invite them back. 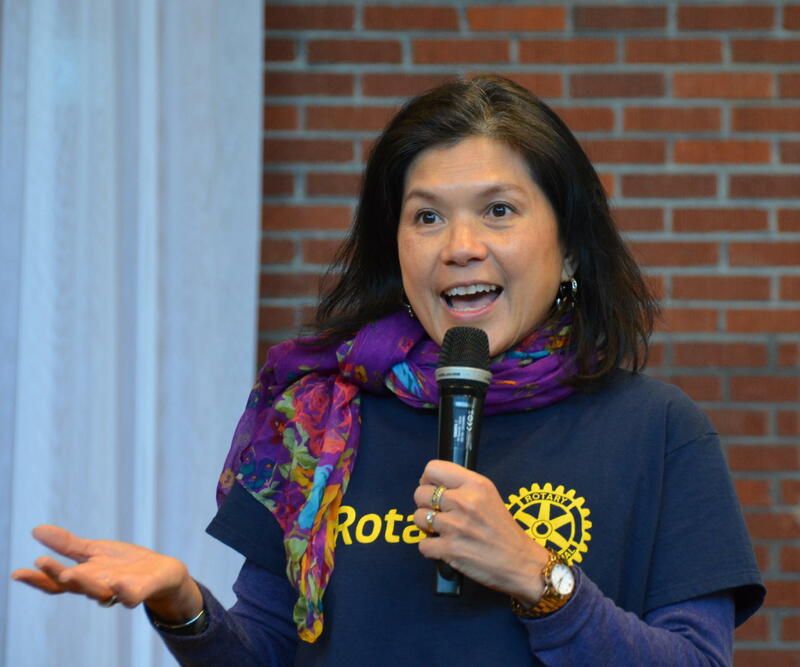 She sees more collaboration between the membership committee and the Morning Club to meet the needs of prospective members and expand the Rotary brand. She also plans to further develop the new Friends of Rotary program. In a sense, we are all members of this committee, in terms of how we interact with new attendees. But if you can donate some time, opportunities include the Friends of Rotary program, coordinating mentors and social activities. The website, Club Facebook page and other social media, and the newsletter all remain important communication vehicles that continue to evolve. If you have an interest in any of these areas, please contact Becky. A SNEAK PEEK AT JANUARY PROGRAMS! Interesting, relevant programs are an important way to draw new attendees and promote the club. 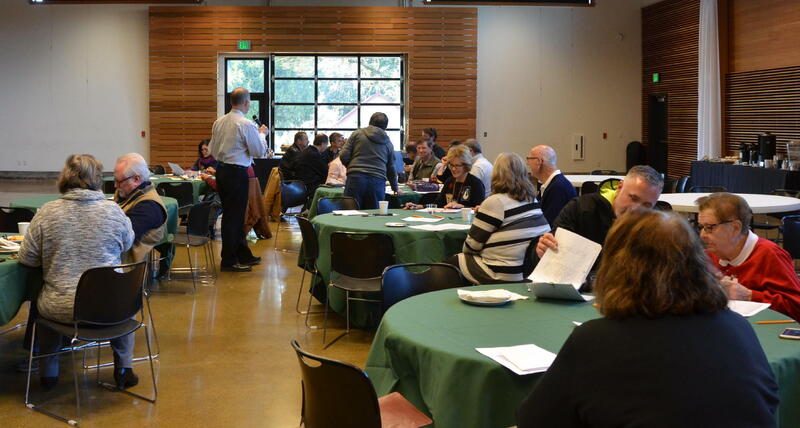 A great-sounding “Lunch and Learn,” two-part series on “Effective Use of Social Media” has been scheduled for our Jan. 3 and Jan. 10th meetings, and will be open to the public. 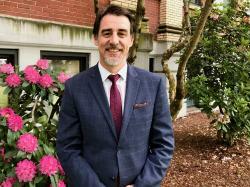 Local “celebrity” Brandon Porter, host of the “Brandon Porter Show,” a weekly show on Facebook that combines business reviews with vlogs to highlight what life is like in Oregon’s wine country, will be the presenter on Jan. 3. Brandon will discuss how to use social media to grow your business, and the differences between social media platforms. On Jan. 10, Marketing/PR expert Ashley Mumm will touch on the importance of branding and marketing, and how they affect your appeal to your target market. ON THIS DATE IN 1935….. This Wednesday marks a very special day in the history of our club. December 20, 1935–82-years ago– was the day the club was organized. It began with 22 charter members and was the 3,910th club in 79 different countries. 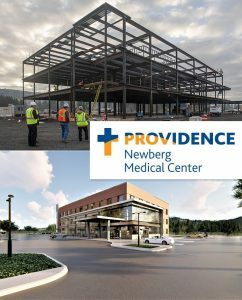 The Newberg Rotary Club was the first service club in Newberg. Art Strickland served as the first President. For more great background, check out the “Club History” section of our website. Gary Stewart, president of the Morning Club, was a guest at our meeting. He reported that Santa Claus is coming to their meeting at 7am on Thursday, the 21st, at the Cultural Center. If you have small children or grandchildren and would like to attend, you must RSVP to Gary. HURRY! TIME TO ORDER YOUR CLUB SHIRTS! The shirts would come from Russell-Hampton and are trademarked by RI so cannot be purchased locally. Tee Shirts—(regular and customized). Regular has Rotary and the Rotary logo on the front; customized differs only by adding the club name (Newberg) to the front for a $4.00 added cost. Both are pre-shrunk 100% cotton; navy blue with gold lettering. The regular was washed in cold water and dried on low without shrinkage. Men’s and women’s sizes could be mix/matched to increase the order and qualify for lower than the base price. You can’t mix/match regular and customized in the same order. http://www.bestclubsupplies.com/Navy-Rotarian–at-Work -Tee/productinfo/RTEE4M for size and other details. COST: Base price for regular: $13.95 each. Order 25: $11.85: Order 50: $11.15 We already have a guaranteed order of 20. Polo Shirts—While the Tee shirt is good for actual physical activities, the Polo is dressier and better for many to wear to work, soliciting for the auction, scholarship interviews, etc. It is 55% cotton and 45% polyester. The regular has only the Rotary logo on the front; the customized has the club name and a selection of Rotary logos. The cost is also significantly higher ($15.00 one time only cost for embroidery tape and $4.00 each shirt). Order soon! You can email Marge at: margeloconnell@gmail.com. Must start off this newsletter with kudos to Past President Leah Griffith for her work organizing the December 2 holiday tree lighting ceremony. Lots of compliments were reported, including, “Leah did a really wonderful job.” Also, kudos to the Interact kids for helping to decorate. Thank you, all! Geoff Gilmore introduces our speakers. We got a great answer to that question from Geoff Gilmore and our two guest speakers last week–Dusty Binkerd and Mikayla Heineck. Geoff introduced the two by saying RYLA (Rotary Youth Leadership Academy) is “all about high performance leadership for youth.” He explained that once applicants like Dusty and Mikayla are nominated and approved, the club provides the fees so they can go to camp. “It’s an absolutely fantastic program,” he said. Sensory overload! “Getting to know you” exercises and instruction in the “flow of conversation.” Wonderful group facilitators. Takeaway: “It was good to learn how to talk with strangers that you are about to become best friends with!” exclaimed Dusty. 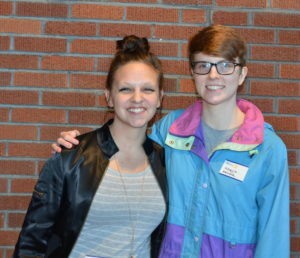 Dusty Brinkerd, left, and Mikayla Heineck, right, share their experiences at RYLA camp. 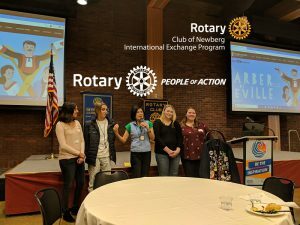 Featured a presentation from Rotary on the “Eradicating Polio” campaign. They also had a presentation on “Expanding Your Comfort Zone,” from Jake French, a speaker who had been paralyzed and was in a wheelchair. Jake talked about his adjustment to his new way of living and forgiveness. “We had a Culture Walk, and ended up knowing more about these people than some long-time friends,” said Dusty. “The camp leaders created an environment for people to be open, accepting and vulnerable.” Takeaway: “Do what you need to do to get where you want to go,” said Mikayla. The Myers Briggs personality test was explained and administered to the attendees, and they learned about their styles and requirements. Also learned about Life Balance. Family Day. Had a presentation from a psychology professor at Portland State University and lots of discussion and sharing. Got together into small “color groups” of 4 or 5 people and facilitators to debrief the day. “We felt lots of love that day,” Dusty said. Professional Day. Business owner Junki Yoshida spoke and told them about his journey to success. 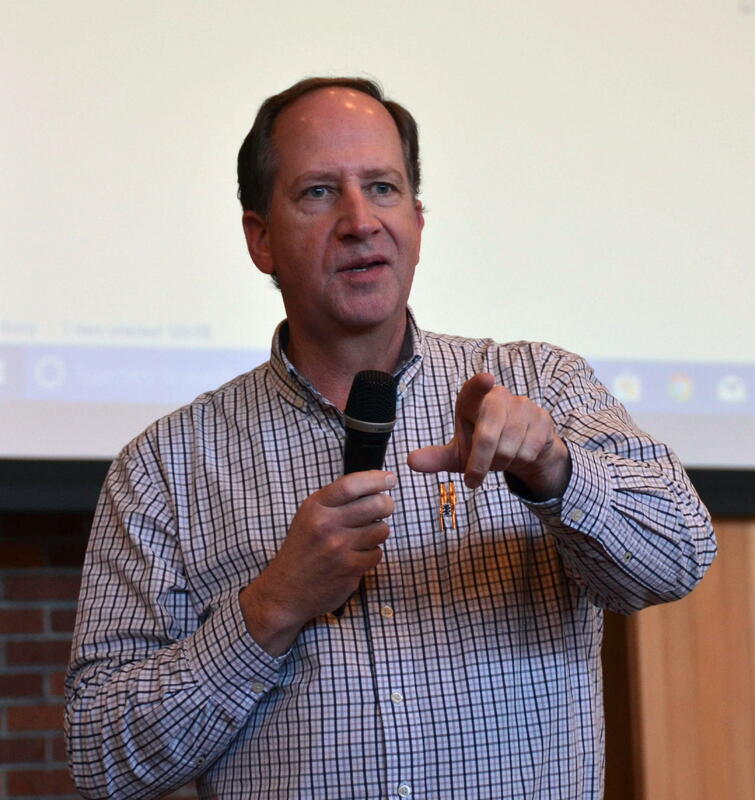 The topic was “Finding Your Why.” Another speaker from the Wayfinding Academy in Portland spoke on life purpose. And they heard from other business owners about personal finances, how to budget, management styles, etc. That evening, the participants put on a talent show. 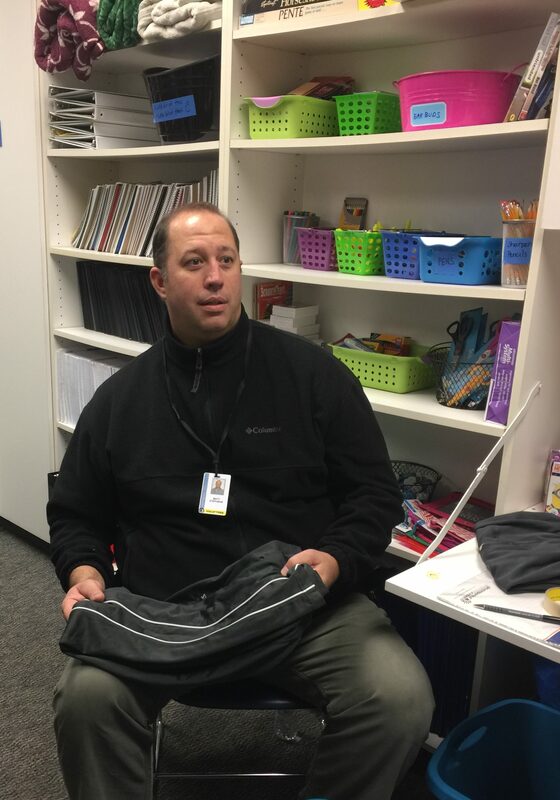 “At that point, it was only 6 days, but by the time of the talent show you’re all very close. As a talent, one person walked on his hands. He inspired me to walk on my hands and I would not have done that before,” said Mikayla. For more information on RYLA, please contact our club’s RYLA chair, Om Sukheenai. 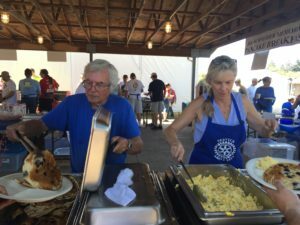 The president of the Sherwood Rotary Club, Neal Brown, joined us last week. Please try to attend this week’s meeting, as it will be Election Day and a club assembly. You will have an opportunity to vote for directors for 2018-2019, as well as join committee(s) of your choice. The club assembly will focus on: membership, club service, PR/marketing, programs, and the Auction. Don’t forget! There will be no meeting on Wednesday, Dec. 20. Instead, the meeting will be Thursday, Dec. 21, when we visit with the local Kiwanis. Same time–noon–and place–Cultural Center. Dale Welcome will hopefully be back at this week’s meeting after having shoulder replacement surgery. 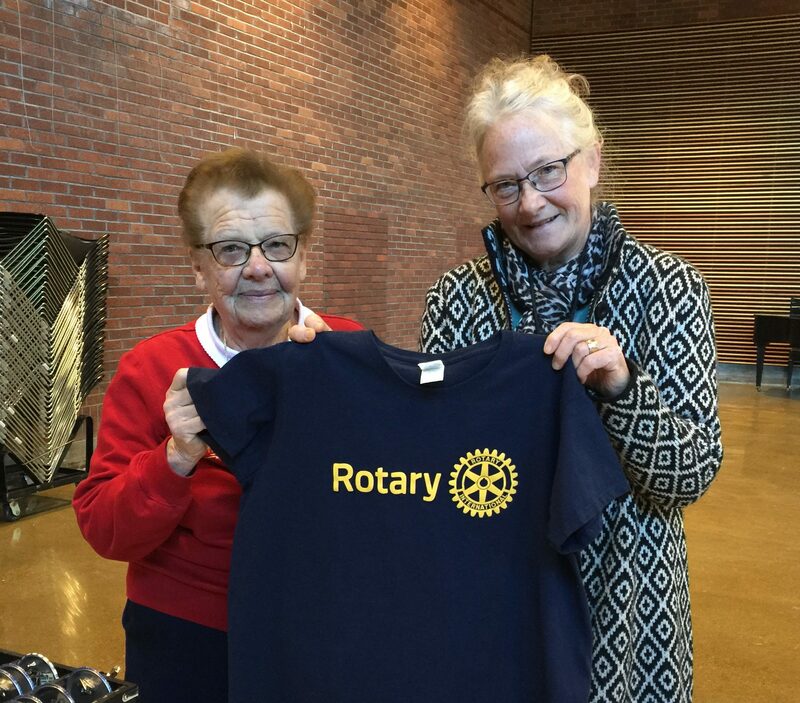 Marge and Judy display a possible club tee-shirt. Marge O’Connell (left) and Judy Robinson are working on a project to offer special Rotary tee-shirts and/or polo shirts for club members to purchase. There will be a price break if enough are ordered. Stay tuned for more info! 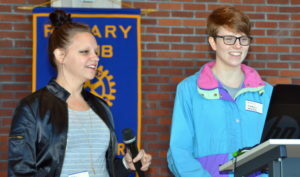 Denise Bacon reported that the Interact Club has picked its International project for this year. They will be collecting solar-eclipse-viewing glasses to send to people in Africa for viewing next year’s eclipse there. If you have some leftovers you could donate, please see Denise. 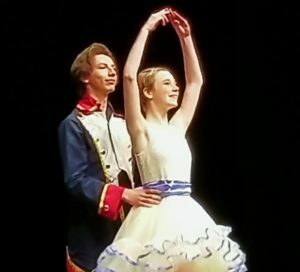 Clara (Anna) and her prince in the Nutcracker. In case you missed it, Shannon Buckmaster’s daughter, Anna (left), played the lead role of Clara in the recent local production of The Nutcracker at Newberg High School. Anna was recently selected to be a Rotary exchange student next year. Matt Stephens was spotted at the new Chehalem Valley Middle School Resource Room, labeling clothing donations that had just come in. Our club is supporting the room, which provides school supplies, food, clothing and other items for needy kids and their families. If you would like to volunteer, please contact Jeff Lane.